During my travels in Europe, I played with gypsy guitarists and learned from them. One of the most important things I learned was that making music can be simple. There are a few chords, three shapes to remember, and that’s all! Well, it’s not all, but all the rest is the interesting stuff – embellishments, trills, sound, feel, rhythm… MUSIC! This method of improvisation became the core of my playing. Playing music became simple: connecting all the arpeggios, tensions and substitutes I knew to one easy formula. This is an enclosure exercise for the second inversion of C (C/G). 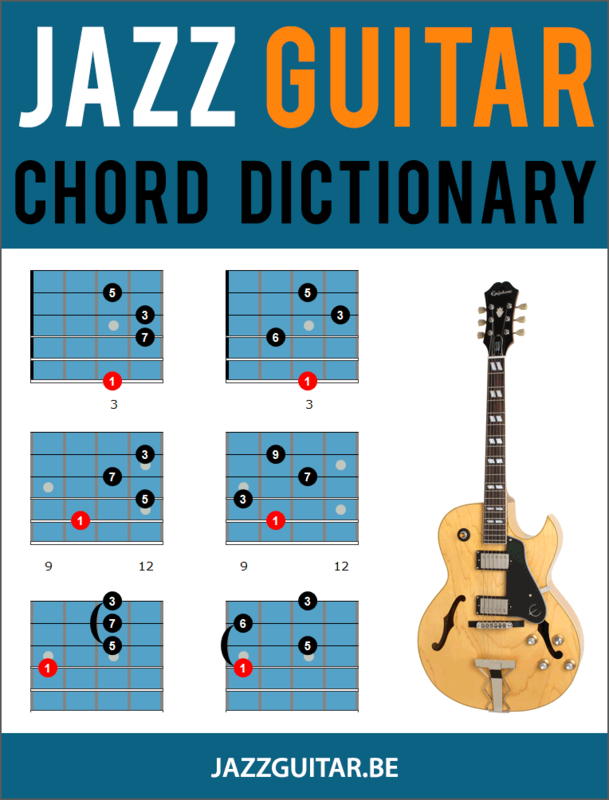 You start with a diatonic note above the chord tone, then play the chord tone, then a half step below the chord tone and then the chord tone again. You do this for all notes of the triad. Step 1 [6:55 in the video]: play an accompaniment using only triad shapes (play a triad for each chord). During chord changes, use chord voicings that are close to each other so that you’ll play all the chords in the same area on the fingerboard. Step 2 [7:55 in the video]: improvise over the All of Me chord progression using these triad shapes. 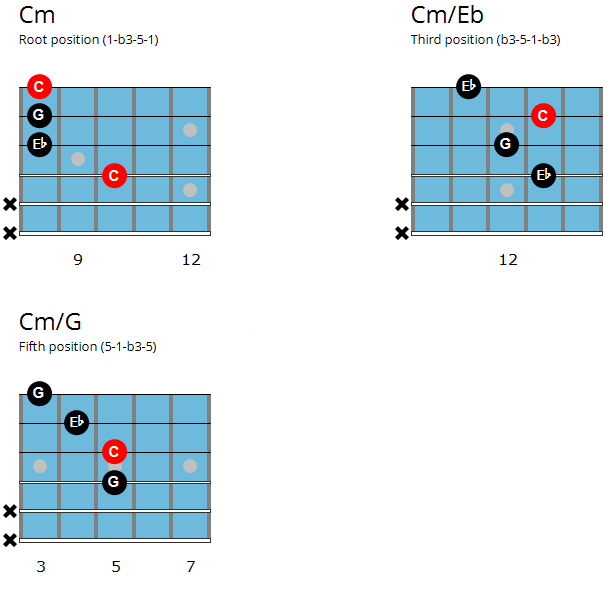 At first, try to stay in the same area on your fingerboard as shown above. Then start improvising all over the fret board using only these shapes. Play simple – even one or two notes per chord. Just to make sure you keep the form. Step 3 [9:32 in the video]: add the half tone approach. For each note of the chord, use a half-step approach: play a chromatic note half a tone below to lead into the target chord note. Improvise using this idea. You can play the chromatic note either on the beat or off the beat. Playing the chromatic approach off the beat gives more tension to the music. Django uses this idea a lot. Step 4 [9:55 in the video]: add enclosures by playing a diatonic note over the chord note and a chromatic note below. Listen to Django’s Minor Swing solo for an example. In his first phrase, he uses the diatonic (of the scale) approach above the target note and a chromatic approach below the target note. 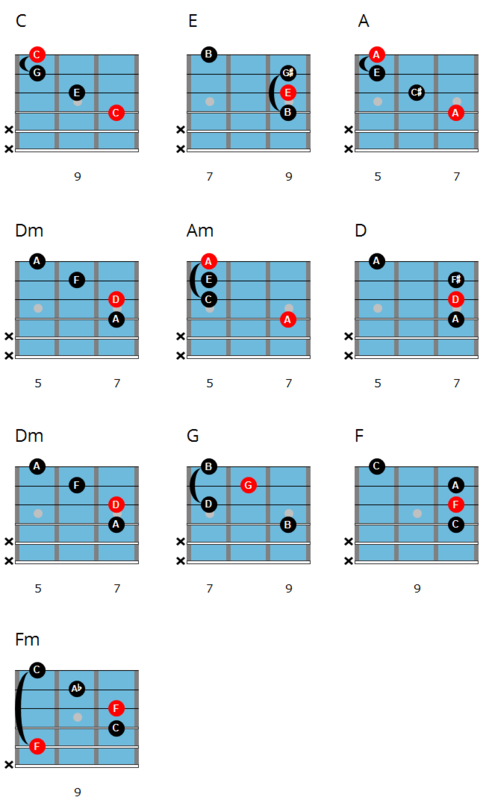 In Django’s solo, the target note is A, which is the root for Am and the 5th for Dm, which is the next chord. Step 5: Connect all the other skills you have (arpeggios, licks…) to those simple shapes. See the melody within those simple shapes so you can always get back to it in the middle of your improvisation. Great lesson. Thank you very much. I will try this approach for a while and see if my fingers can follow. Enjoy! The best thing with this concept is that you can create beautiful solos fast, only with the skills you already have now. Great lesson. I use a lot of your concepts. Been interested in Gypsy Jazz guitar since I realized that Wes Montgomery used some of those techniques too. Thank you very much. Django had influenced all the major jazz guitarists. From Wes to Joe Pass to McLaughlin, just name it. It is because Django was a jazz guitarist. A genius one. In his eyes he played jazz and not gypsy jazz. This term was created only years after his death- based on his own way of playing. What a great snippet of a lesson. Great clear explanations. Keep up the great work! Un grand merci à l’auteur pour ce partage … magique! Lol. I was just getting ready to comment that your are essentially arpeggiating around the triads. Then you actually said it in the video. I’ll be trying this tonight. Great. Share with us how it went.. This is what I’ve been searching for! Thank you!! Great lesson. Great lesson, thanks a lot for share with us, I’m from Brazil. Using only upper case is considered SCREAMING AT THE READER!!!…. Not so polite. Dirk and Yaakov make a huge effort and create wonderful lessons. We should be thanking them, not scream at them. @Yaakov & Dirk: thanks for this great lesson. Laughing at your comment, Johannes. I had assumed Steve had his caps lock on by mistake! Great lesson and great graphic presentation too! GET A LIFE, YOU PRICK! YOU MAY WANT TO LAY OFF THE CAFFEINE TOO! 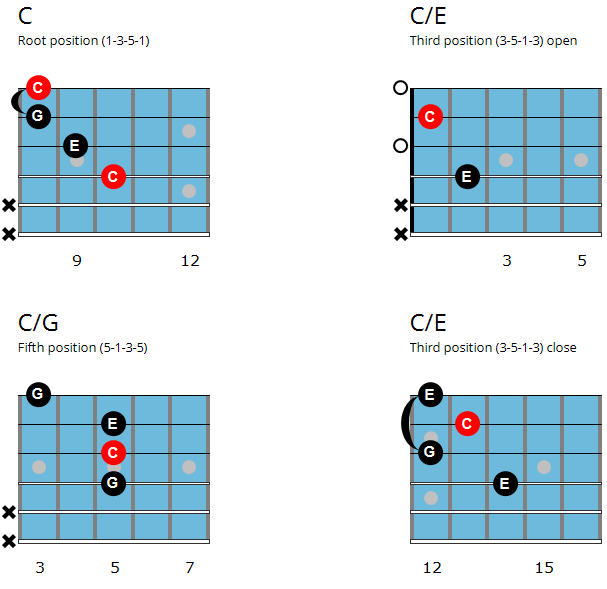 Question : if you want to highlight a C7 chord (with Bb) how do you use the triad concept ? maybe using a E-7(b5) ? Thank you Yaakov for the great lesson. Have been playing now for 50 plus years (blues), now learning jazz. Thank you for this real cool stuff. Thanks alot for your inspiration, great tutorial! This is such a good lesson at all levels. What I found helpful was how it provides a simple “map” or path back to the melody. Thank you for sharing this Great lesson. For years I have been studying all the scales and altered scales and trying to “apply” them over chord changes… Not really getting anywhere. This Triad concept makes it fun and much more simplified to begin improvising. A Musicians goal is to create music and improvise spontaneously, not to apply complex mathematical formulas like a scientist. Excellent lesson indeed. Thanks! Yaakov, thank you so much for the great lesson(s). As someone who understands these concepts but has a hard time putting them into practice in ‘real time’, this particular video was a big help. I have a question though, maybe I misunderstood something. 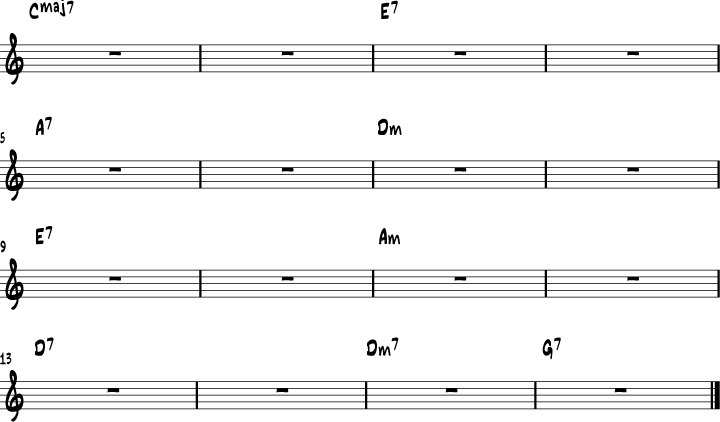 You talked about adding tones a half step below, and a full step above the chord tones: but how does that work with, for example, the 7th chords in ‘All of Me’? (minor 7th and dominant 7th) You’d be playing a major 7th in the solo while the rhythm was playing minor 7ths. I know you don’t want to get into the theory too much, but I just wanted to make sure I understood what you were saying correctly. Thanks for sharing your story and showing and showing the way to a complete simplified method of progressivly applying the triads in all its inversions and how to apply it to improvise thrugh chord changes. me semble-t-il, qu’il parle autant. Son accent facilite portant la compréhension pour un français. Donc, leçons de guitare et de langue combinées. Great lesson. I’m struggling with Jazz because it’s overwhelming but this lesson and genre actually feels like it’s someting I can achieve. I am very much in the same boat John. As an aging newbie to jazz, I am, like the previous comment, in a constant state of overwhelmed-ness about the in depth nature of it all, so Yaakovs reassuring demonstration that it can be as simple as relying on a few easily remembered triads, is very encouraging. Thanks to both Yaakov and Dirk for all of these informative articles. There’s something I’m confused about. When you say to play a diatonic tone above the chord tone do you mean diatonic relative to song key or the underlying scale of the chord? Thanks Yaakov, I wish I had understood this lesson earlier in my jazz education. After CAGEing and Arpeggioing myself to death, I still didn’t sound very musical, and I couldn’t think quickly enough to play over even simple harmonies in time, but more recently I’ve been studying some of Charlie Christian’s solos. Like Django before him, his playing, too, is based on simple triads and chord shapes augmented by knowledge about the notes in the neighborhood. On paper, his licks look too simple to be interesting, but with good neighborhood note selection and better rhythm and some swing, they are so delicious. Thanks for sharing this important lesson.